Sony added the A6400 mirrorless camera to its arsenal in India. This cam falls in the APS-C mirrorless camera lineup in the country. People can purchase the camera from today onwards from Sony Centre outlets, and other major electronic stores. According to Sony, A6400 has the fastest autofocus acquisition speed of 0.02 seconds along with real-time Eye AF and tracking. The price of Sony A6400 is Rs 75,990 for the body, throw a 16-55mm lens and the price becomes Rs 85,990. With an 18-135mm lens the price shoots up to Rs 1,09,990. Its design is somewhat similar to Sony A5100 but that’s about it as it packs much better specifications with a hybrid autofocus like the type used in Sony’s flagship camera the A7R III. Which also uses 425 points phase detection. The real-time Eye AF it has does what it says, it uses AI to identify if there is a person whose picture is being taken and focuses on the person’s eyes. Then it adjusts the speed and accuracy of the picture. It works on animals as well so this camera becomes a great choice for wildlife enthusiasts. The camera has a 24.2MP Exmor CMOS image sensor and Bionz X image processor for taking photos. The processor gives the camera an ability to shoot up to 11 fps with mechanical shutter, but when the camera is put in the silent shooting mode it goes even further to give 8 fps. Now that is impressive. But with the silent shooting the continuous AE and AF must be turned on. 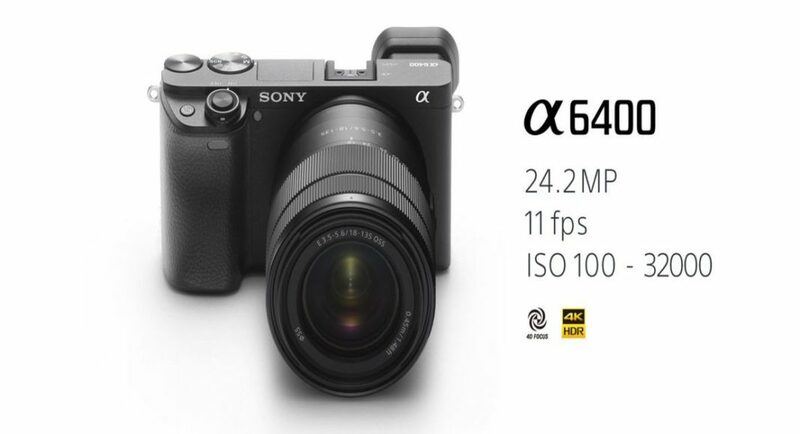 The ISO range of Sony A6400 ranges from 100 to 32,000. This means it can handle low-light shooting extremely well. It can also record 4K videos without pixelating and has a 180-degree viewfinder tilt function that proves useful in many situations. The camera also comes with connectivity options like built-in Wi-Fi, Bluetooth and NFC. So photos and videos can be imported or exported to and from online sources or an external device. The camera, however, misses out on in body image stabilization department. It has an NP-FW50 battery with USB port for charging the battery. It also comes with a USH-1 card slot for storing the captured images. It also has a low-resolution viewfinder, which maxes at 2.4 million dot XGA OLED. We feel, the camera would be loved by the wildlife photographers because of its Eye AF for capturing the real wild, the high ISO range for the low light situations and the ability to capture and record in extreme low fps for those fast-moving animals, creatures or objects.